"I can't say that I dreamed of being an astronaut as a child," the soft-spoken U.S. Navy commander said. "Rather, doors of opportunity opened. First, to go to the Naval Academy, then to go to naval aviation." McCool grew up building model airplanes in Lubbock, Texas, and followed in his father's footsteps as a naval aviator. As a test pilot, he realized he was on the right track to become an astronaut, and he applied for the job when he was in his 30s. After two applications, he made it. Like Commander Rick Husband, McCool had Texas connections although his hometown was San Diego. "We kind of are surprised that we didn't bump into each other," he said. "My mom was teaching at Texas Tech at the same time Rick was going to school there." 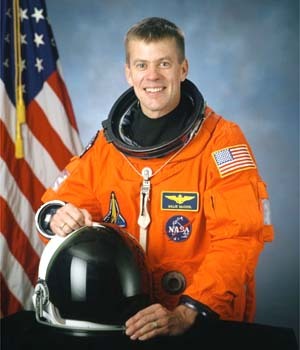 McCool was Columbia's pilot and a rookie astronaut. He didn't hide his excitement at getting to go to space. "One of the biggest challenges that I'm faced with oftentimes is being able to push that excitement onto the back burner and to stay operationally focused on the tasks at hand, and that's, I'm sure, a challenge of every first-time flyer," he said. Once he got to space, he found a "smorgasbord" of "invigorating and fun and sometimes not so fun experiences," he said Wednesday. He spent a lot of his time maneuvering the orbiter. "I've had the opportunity to be on the flight deck probably more than most of my crewmates to look outside and really soak up the sunrises and sunsets, the moonrises and moonsets, the views of the Himalayas, Australia, all the continents," he said. McCool received a bachelor's degree in applied science from the Naval Academy, a master's degree in computer science from the University of Maryland, and a master's degree in aeronautical engineering from the U.S. Naval Postgraduate School. McCool and his wife, Lani, had three children.